PALM SPRINGS, Calif. — Tuesday’s slate of games kicked off with the Alberta Grizzly defeating the Toronto Rush, 7-6, in eight innings at Palm Springs Stadium. Seven innings wasn’t enough to decide this one, and although extra innings are not usually played in the California Winter League, both managers agreed to play extras in hopes of deciding a winner. The Grizzly (2-2-1) lineup came to play, as they grinded out four runs in the top of the first off Rush starter Nicholas Cuckovich. Brett Thompson led off the game with a double before stealing third base and coming around to score on a throwing error by Cuckovich, then the next three Grizzly hitters all drove in runs. Carl Witkowski plated a run on a fielder’s choice grounder, Jeturi Brown brought one home on a single to right field, and Adam Gauthier had an RBI groundout. The Rush (3-2) answered with one run on Peter Pena’s RBI single in the bottom of the inning, making it a 4-1 Grizzly lead after the first. The Rush added two more in the third, with Robert de Angelis doubling home one of the runs to make it a 4-3 game. The Grizzly got one back in the fourth on Christopher Mangus’ RBI single, scoring Gabe Gunter. Down 5-3 in the fifth, the Rush tied the game on Hector Marmol’s two-out two-RBI single up the middle. The Grizzly retook the lead in the top of the seventh, 6-5, but the Rush answered to tie it with a two-out run in the bottom of the inning on a wild pitch. The Grizzly went ahead again, 7-6, in the eighth on Gunter’s sacrifice fly to center field, and Adam Cornwell pitched a clean bottom of the eighth to wrap up the game. Cornwell got the win for Alberta while Cody Pamperin suffered the loss for Toronto. Grizzly starter Louis Cohen took a no-decision, but dominated in five innings of work, striking out nine hitters and allowing just one run. 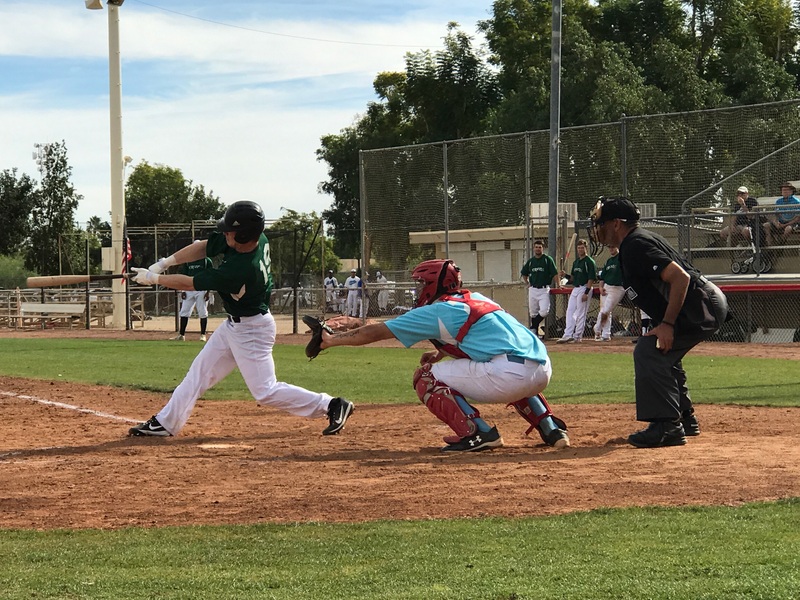 Game two featured the Canada A’s defeating the British Columbia Bombers 5-1 at Palm Springs Stadium on Tuesday afternoon. The contest was highlighted by A’s starter Logan Gillaspie, who got the win after allowing one run on four hits with eight strikeouts and four walks over 5.2 innings pitched. Canada (5-0) got on the board first in the second. Tyler Post singled, stole third base and later scored on a Giovanni Leon base knock. Trailing 1-0, the Bombers (1-3-1) tied the game in the fourth. Jordan Zazulak walked and scored on an RBI groundout by Stephen Valdez. The lone tally would be the only run pushed across by British Columbia, as Gillaspie and Clayton Dostal allowed a mere five combined hits over seven innings pitched. Canada regained the lead for good in the fifth inning. Jack Landwher relieved Jaramy Jacobs and allowed Ryan Adams and Mike Adams to reach. With two men on, Connor Grote blasted his second home run of the Winter League to give the A’s a 4-1 lead. Leon later scored an insurance run, as James Stea singled him home in the sixth to increase the lead to 5-1. Dostal allowed a man to reach third base in the top of the seventh, but got the save after the British Columbia side was retired without a run scoring. Landwher was tacked with the loss. Wednesday, January 31, features “$1 Admission Day” at Palm Springs Stadium, presented by Jack in the Box. Fans will be admitted to the ballpark for just $1. The double-header on the main field features the Oregon LumberJacks facing the Manitoba Northstars at 10:00am, and the British Columbia Bombers taking on the Palm Springs Chill at 12:30pm. Those who cannot make it to the game can listen to the broadcast live online at CaliforniaWinterLeague.com.